Lavish Polish - Christmas Collection - Polish Etc. 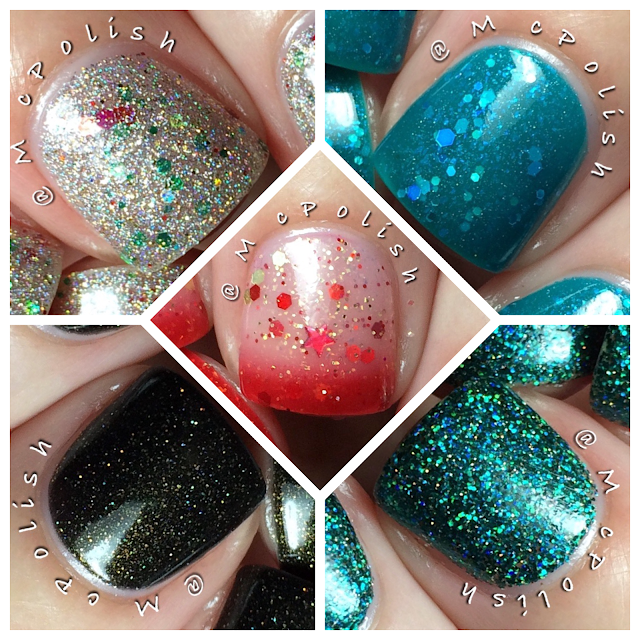 Tonight, I have a lovely little holiday collection from Lavish Polish to share with you. This a set of five polishes, all of which have a different finish. There is only one shade that is obviously Christmas. The rest of the collection could be worn all year round and not make you think of Christmas. The Christmas Collection released last week and is available for purchase now. You can get these polishes individually or save money and buy the whole set. Let's take a look! "Holly-days" is the most Christmasy polish of the bunch. This is a clear based polish packed with silver holo microshimmer, gold flecks and larger red, green and gold holo hexes. You can wear this as a topper or build it up to opacity on it's own. Here, I used just two coats alone with Lucky 13 Lacquer Elemental Ward top coat. It's super sparkly and a great choice for sparkly Christmas mani. "Dancing Elves" is another super sparkly choice. This is your typical holographic microglitter. The color of the glitters is a teal leaning green and there is a sprinkling of silver holo shimmer, too. The base is clear so you can use this as a glitter topper if you wanted. I like to wear microglitters as full coverage manicures. They are just so sparkly! I used three coats topped with Lucky 13 Lacquer Elemental Ward. "Santa's Sleigh" is a thermal! In it's warm state, the base is clear. As it gets colder towards the tips it turns bright red. The thermal shift is great. I didn't have to dunk my hands in cold water or anything. There are gold flakies, red and silver stars, gold glitters and some holo sparkle. I did two coats topped with Elemental Ward. My ring finger is always the coldest, weirdo. "Icy Christmas" is a teal crelly packed with glitters and shimmer in multiple shades of blue. The shimmer is very prominent in this one and gives the base an almost cloudy quality. Like ice and snow!. Formula was great. I did two coats topped with Elemental Ward.